"Eggplant without garlic? Yes, it can work - deliciously. 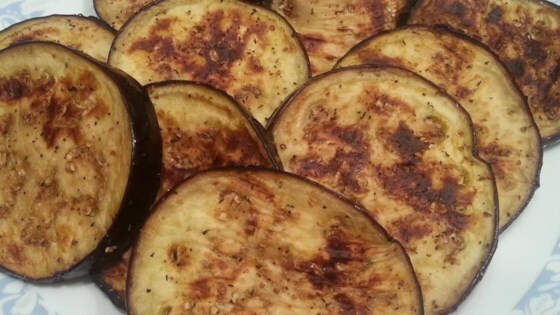 This recipe seems to me to bring out the glorious flavor of eggplant and is wonderful for a change to other garlicky eggplant recipes. It is important not to pulverize the coriander. " Brush both sides of each eggplant slice generously with olive oil; arrange in a single layer in the bottom of a broiler pan. Scatter about half of the cracked coriander seed over the eggplant slices. Cook under the broiler until browned, 5 to 6 minutes. Flip and season with the remaining coriander seed; cook under the broiler until browned, 3 to 4 minutes. Whisk the lemon juice, basil, and salt together in a bowl; drizzle over the broiled eggplant slices. Serve warm. This was ok. I didn't have coriander seed so I used ground coriander. 5 stars. So simple and very very tasty. Really easy and still good. I used oriental eggplant. Great recipe. Next time I'm going to cut the peal off.